Automatic differentiation is a powerful technique which allows calculation of sensitivities (derivatives) of a program output with respect to its input, owing to the fact that every computer program, no matter how complex, is essentially evaluation of a mathematical function. In banking, automatic differentiation has many applications including, but not limited to risk management of financial derivatives, solving optimization problems and calculation of various valuation adjustments. The problem with this approach is the fact that too big differentiation step \(h\) ignores second-order risk (convexity). On the other hand, differentiation step which is too small brings to the light another complication related to the way how floating-point model of a CPU works. Operations on floating-point operands with disproportionate exponents lead to serious rounding errors. Example of such operation is \(x+h\) from the formula above, since \(x\) is considerably larger than \(h\). The problem gets even more complicated for situations involving second-order risk. Moreover, due to increased regulatory requirements imposed on banks as part of the CCAR and FRTB frameworks, many banks are nowadays forced to reorganize their risk calculation and stress-testing infrastructures. In many of such situations, automatic differentiation can be the only plausible solution. There are few approaches to AD such as "operators overloading-based", "handwritten" and "code-transformation". This article address approach which utilizes C++ templates and overloading of C++ operators. As each of the named approaches has its own advantages and disadvantages, the choice depends on a problem domain, maturity of the software project and constraints of the programming language. As mentioned, operators overloading-based AD utilizes two features of the C++ language, i.e. overloading of operators and function templates. Operators overloading in the context of AD is used to alter behavior of elementary C++ operations such as "+", "-", "*" and "/" in order to record derivatives to its operands alongside the results as the calculation progress. We will also show how function templates are used in order to redefine existing C++ functions with AD-aware data types (e.g. ADDouble), on which the C++ operators are overloaded. Now, the only question remains how to overload C++ operators so the derivatives will be recorded for each operation automatically. Let's define a new data type ADDouble. This variable behaves pretty much the same way as the standard double, except the fact that it has unique identifier. This identifier is used to track the sequence of operations as illustrated on the figure above. The tree-representation of this calculatiion is stored in a global storage called AD Engine. The next step is to overload "+" and "*" operators and logarithm function for ADDouble data type. Each time when the operator is executed, the function will instantiate a new ADDouble data type and it will store direct derivatives of the result with respect to its input into the AD Engine tree. Referring to the example above, let's say we are interested in sensitivity of function \(y=f(x0,x1)\) to input variables \(x0\) and \(x1\). 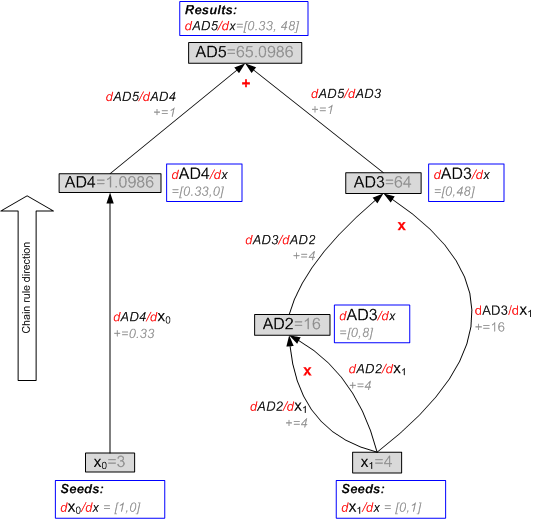 Variables \(y\), \(x0\), \(x1\) are represented in the derivatives tree by nodes AD5, AD0 and AD1. 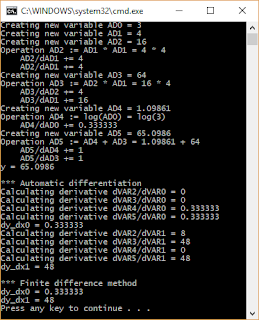 Step 3: Perform the calculation by invoking the target function only once. All derivatives will be calculated automatically. The aim of this article is to illustrate the principle of operators overloading-based automatic differentiation. The implementation is provided just for the sake of illustration and is not meant to be used in production environment. For this purpose, I advice to use one of the existing high-performance AD libraries such as NAG DCO/C++. Performed on the level of atomic C++ operations. Therefore, it is fully transparent to higher-level language constructs such as function calls, classes or inheritance hierarchies. Suitable for legacy projects as adding AD support is just a matter of templatising the existing algorithms. Easy to comprehend from the user's perspective. Compared to the handwritten approach to AD, fairly resilient to bugs. In some circumstances quite memory consuming due to the fact that every single arithmetical operation leaves memory footprint. Due to memory concerns, not suitable for data-intensive algorithm which performs iterative calculations such as Monte Carlo. Copyright © 2017 Ondrej Martinsky. Simple theme. Powered by Blogger.